NEB notifies the concerned students and schools who missed the exam form fill-up for the board exams of grade 12 and 11. The Examinations for Grade 12 & 11 are scheduled to be held in the months of Baisakh and Jestha 2075 B.S. When Is The Last Date To Fill Form For NEB Exam 2075? 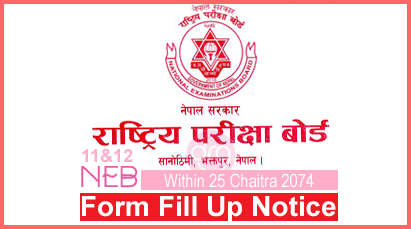 0 Response to "NEB Announces Grade 11/12 Form Fill Up Notice Within 25 Chaitra 2074"